We're starting to catch up on our game-a-week now that all the Bryants are healthy again (knock wood). Last night's pick was Pandemic: The Cure, which is a dice based version of the popular co-op board game. Our gaming party was two parents over forty, a college freshmen, and a tween. All of us were already familiar with the premise and structure of the game from playing the board game. 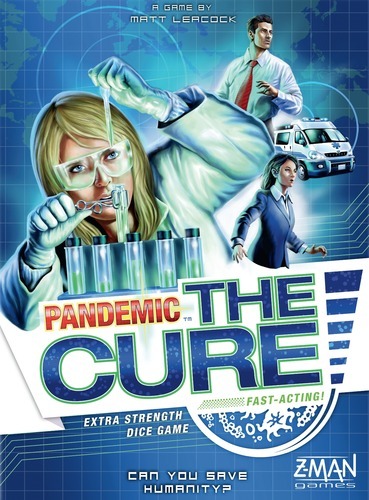 In both the board game and this dice-based version, a player takes on a role such as medic, dispatcher, scientist, or generalist (among others), which comes with certain special abilities regarding freedom of movement or ease of performing different steps. We work together as a team to try to contain and cure four diseases within the time constraints. This game was tense and exciting, like the original. The dice element made the gameplay faster, eliminating some analysis paralysis since you are limited to using the options you roll. That was good and bad. The round track you use to track things on was physically awkward, but made good logical sense and was easy enough to read once I understood it. We won in the eleventh hour, winning the final cure just in time, which is my favorite way for the game to go. So, I don't like it as much as the boardgame overall, but did appreciate the faster gameplay. I got two walks in the sunlit woods today, one in the morning and one in the afternoon, one with my husband and one with one of my daughters (both with the dog). The water sparkled in the light and I felt lit from within. Some time in the outdoors is so important to my peace of mind. Good light, good company, good places.